Spectacular doesn’t even begin to describe this Lakeside four bedroom Deer Valley luxury retreat. Located in one of the best areas of the Lakeside community right on the shores of one of the ponds, guests enjoy a serene and peaceful setting whatever the season. The perfect choice for two families traveling together, this home offers two master suites, a spacious guest room and a bunk room you’re younger guests will love. Enjoy evenings by the grand and contemporary stone fireplace, or pair up for a foosball tournament in the recreation space. Location is one of the most sought after amenities for any ski home, and this property has it in spades. Only a half mile from the slopes of Deer Valley, 60 yards from the free Deer Valley Snow Park ski shuttle, and steps away from the free Park City shuttle service, guests have access to all of the Park City area at their doorstep. Cozy up next to the gas fireplace,, or take a stroll to the common area year-round pool and hot tub complex to relax and rejuvenate after a day of Park City adventures. 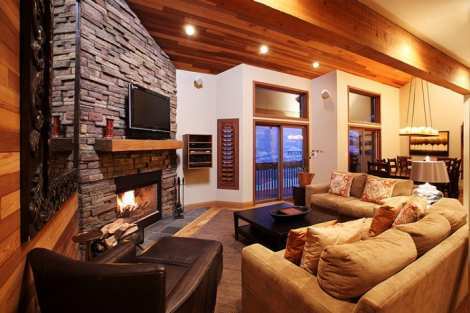 Guests truly have everything they could possible ever desire in a home base for a memorable Park City holiday. Although a car isn’t needed with this location, and attached two car garage is offered for your car and gear storage. We loved the condo, the property, the area, and everything Deer Valley had to offer. We can't wait to come back again as soon as we can!